Justice is blind. Equality before and under the law. Fairness. Integrity. Transparency. These are all hallmarks of a justice system that works. But as is so often cited, but perhaps less well understood: it is not enough for justice to be done, it must also be seen to be done. In other words, appearances matter. And in the case of engineering company SNC Lavalin, what appears to be happening is that a big corporation is deploying large amounts of money and political connections to dodge legal accountability for its role in a corruption scheme involving government contracts abroad. The fact that the Justice Minister apparently withstood heavy political pressure from her political bosses in the Prime Minister’s Office is good news for the short term, but has unsettling implications for the future. The company is facing criminal charges under the Corruption of Foreign Public Officials Act. Those charges were laid in 2015, and ever since, the corporation has been lobbying for special treatment from the justice system that is not available to the rest of us. In the US, some companies that break the law have recourse to a legal option known as a “deferred prosecution” or “remediation” agreement, that permits them to avoid criminal prosecution in return for a public admission of wrong-doing, and a large fine. Under such an agreement, the corporation avoids the consequences of a criminal conviction, which can include being shut out of government contracts and financial markets, and result in enormous losses to shareholders. In return, the government gets a pile of money and avoids the time-consuming effort of a trial. This convenient procedure was not available in Canada until after SNC Lavalin was charged. The company is a big political player, especially in its home province of Quebec, and according to news reports, has been heavily lobbying the federal government for a deferred prosecution option to be included in the Criminal Code. Liberal Party politicians, who rely on votes from Quebec, where many of Lavalin’s jobs and engineering projects are located, were happy to oblige, and quietly slipped in such a provision into a Justice bill that has recently become law. 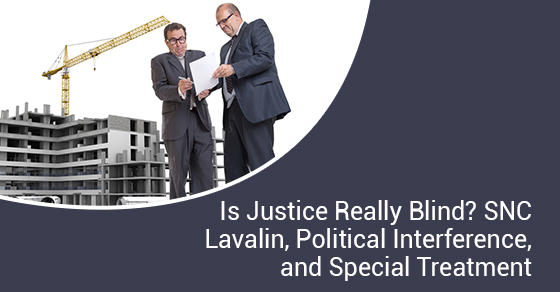 Now equipped with the tools to avoid further criminal prosecution, Lavalin sought to have the Justice Minister, and her department, terminate the case against the company. But they did not count on resistance to their plans from the Justice Minister, Jody Wilson-Raybould, a former prosecutor (not from Quebec) who, if the news stories are correct understood the importance of her ethical obligations. When they were blocked by the Minister, the company’s lobbyists went over her head to the Prime Minister’s Office, which, according to reports in the Globe and Mail, sought to pressure the Minister of Justice to drop the charges against Lavalin as part of a remediation agreement which was now available to them. The Minister refused to yield to the political pressure, and was fired from her job as a result, which shows how much the Prime Minister’s Office wanted this deal to be done, and for Ms. Wilson-Raybould to toe the party line. In her place is a new Minister, this time, not surprisingly, from Quebec. We shall see what happens now. So far, it is good news that political interference with those principles of impartiality, integrity and transparency has so far been rebuffed. But the allegations are troubling, because the backroom deal that this wealthy and well-connected corporation lobbied for is not one that would be open to ordinary Canadians. Lavalin has tried to justify an exemption from prosecution by claiming that it has reformed its previous corrupt conduct, and that those responsible had left the company. They have learned from this situation and now boast that they have a “world-class ethics and compliance program”. But for all other Canadians, saying sorry and promising not to break the law next time isn’t sufficient to get your criminal charges dropped. If you break the law, you are charged and prosecuted in a fair and open process. That is how the system works. Lavalin warns that a conviction could jeopardize jobs and cost shareholders their profits. But if you and I break the law, the government won’t drop the charges against you because a conviction might cost you your job or result in hardship to your family. This scandal implies that this government believes that there should be a different standard of justice for the wealthy and well-connected. And the appearance that the Trudeau government has created, that some big corporations can dodge legal accountability by knowing the right people and spending large amounts of money, undermines the trust that Canadians have in their institutions. Canadians place a great deal of faith and trust in their institutions, such as health care, education, and their justice system, because they are perceived to be universal, fair, and accountable. Back-room deals, influence and special treatment for moneyed interests and the well-connected, strikes at the heart of the principles underlying that trust. Just look at the how the influence of money and special treatment has corrupted the faith that Americans have in their own institutions, and one can see how easily public trust can be eroded. The politicians are dodging responsibility for their alleged role in pressuring the Justice Minister. This is disheartening, but pretty much what one has come to expect from politicians. But shouldn’t the fact that the Minister stood up to political pressure be a testament to the strength of the justice system, that integrity triumphed over back-room arm-twisting? In this instance, yes. The politicians will be held to account by voters should these reports of undue influence be borne out. But if the integrity of the justice system, or the public trust in our institutions, depends on the conscience of its Minister, or on the dedication of a small number of investigative journalists, then they are not nearly on as solid a foundation as we would all like to believe. As this post is being written, the federal Ethics Commissioner has announced an investigation. That is a good start.